Tampa Bay Buccaneers quarterback Jameis Winston is expected to be suspended three games following an investigation into a claim that he groped an Uber driver in 2016. There is some confusion as to whether Winston is being suspended for violating the personal conduct policy or failing to report the incident to the league. Winston is not expected to appeal the suspension, leading some to wonder if he has a deal with the league to make the suspension shorter in return. Tampa Bay Buccaneers quarterback Jameis Winston will reportedly be suspended for three games as the result of an eight-month NFL investigation into claims that he groped an Uber driver in 2016. Last November, Buzzfeed reported that an anonymous Uber driver claimed Winston had grabbed her crotch while riding in her car at 2 a.m. in March of 2016. Though no police report was filed, the woman did report the incident to Uber, which suspended Winston’s account. After Buzzfeed’s report, the NFL launched an investigation. Winston denied the accusations and said he was in the backseat of the car. Philadelphia Eagles cornerback Ronald Darby was also in the vehicle and sided with Winston, saying another unidentified rider was in the front seat. However, according to ESPN, the NFL found that Darby was not in the car for the duration of the ride, thus discounting his version of events. However, there is some confusion over the reason for Winston’s suspension. First-time violations of the personal conduct policy typically result in six-game suspensions – Dallas Cowboys running back Ezekiel Elliott served a six-game suspension last season for domestic violence allegations. ESPN Tallahassee radio host Jeff Cameron first reported the impending suspension. According to his source in “Winston’s camp,” the suspension would be due, at least in part, to Winston’s failure to notify the NFL of the allegation that had been made against him. This is significant because it could impact public perception of Winston and the incident if it is perceived that he was suspended over a procedural misstep with the league rather than the incident itself. 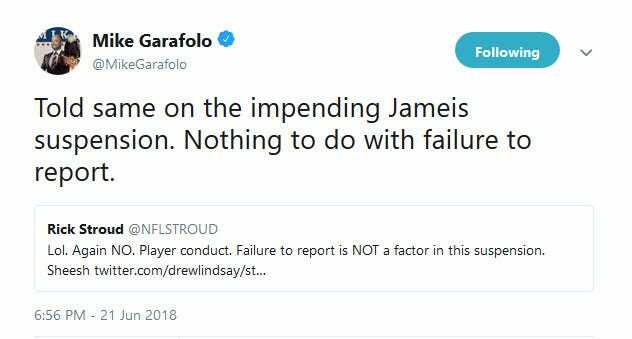 However, both NFL Network’s Mike Garafolo and Tampa Bay Times’ Rick Stroud reported that Winston is being suspended for violating the personal conduct policy and that the failure to report was not the reason. Adding to the confusion, SB Nation’s Gil Arcia writes that failing to notify the NFL of issues that could violate the conduct policy is in itself a violation of the conduct policy. Winston is not expected to appeal the suspension, which has not been made official yet. Pro Football Talk’s Mike Florio speculated that Winston might have made a deal with the NFL – a shorter suspension in return for not appealing the punishment, thus dragging the NFL back into court, as happened with Elliott and Tom Brady in Deflategate. Florio suggested that that language sounds as if Winston has a deal with the NFL. “That feels like the kind of term that would be added to a negotiated compromise aimed at wrapping things up easily, while also making it even easier to whack him with another penalty if he runs afoul of the NFL’s expectations,” Florio wrote. Winston has a history of off-field incidents. While at Florida State he was accused of sexual assault, though charges were never filed. Winston also was cited for shoplifting and was suspended for yelling a sexually explicit statement while at school.